FREE POSTER A double-sided poster featuring the Thirteenth Doctor, Graham, Ryan and Yasmin. SERIES 11 NEWS Interviews with the writers and directors of Series 11, with an introduction from showrunner Chris Chibnall. ROY SCAMMELL The film and TV stuntman discusses his unforgettable contributions to the series in the 1970s. DON HARPER The life and career of the composer whose score for The Invasion is about to be released. LISA BOWERMAN The actress who has played Bernice Summerfield for 20 years answers questions from the TARDIS tin. ALAN BENNION A tribute to the actor who played three Ice Warriors in 1960s and 70s Doctor Who. TIME OF THE DALEKS Inside Gale Force 9, the company behind the latest Doctor Who board game. THE CLOCKWISE WAR Part Six of this comic strip adventure featuring the Doctor and Bill. THE TIME TEAM The reviewers watch three pseudo-historical stories: The Time Warrior, The Talons of Weng-Chiang and Thin Ice. THE FACT OF FICTION In-depth analysis of the 2013 Eleventh Doctor story Hide. COSPLAY Australian comedian Rob Lloyd explains how he creates his Third Doctor look on a budget. Can anyone tell me what 6th Doctor episodes are a part of the The Trial of a Time Lord boxset? The Trial of a Time Lord is made up of 14 Parts. Parts 1-4 are a.k.a. The Mysterious Planet. Parts 5-8 are a.k.a. Mindwarp. Parts 9-12 are a.k.a. Terror of the Vervoids. Parts 13-14 are a.k.a. The Ultimate Foe. I hope that helps. Parts 5-8 are a.k.a. [I]Mindwarp[/i]. 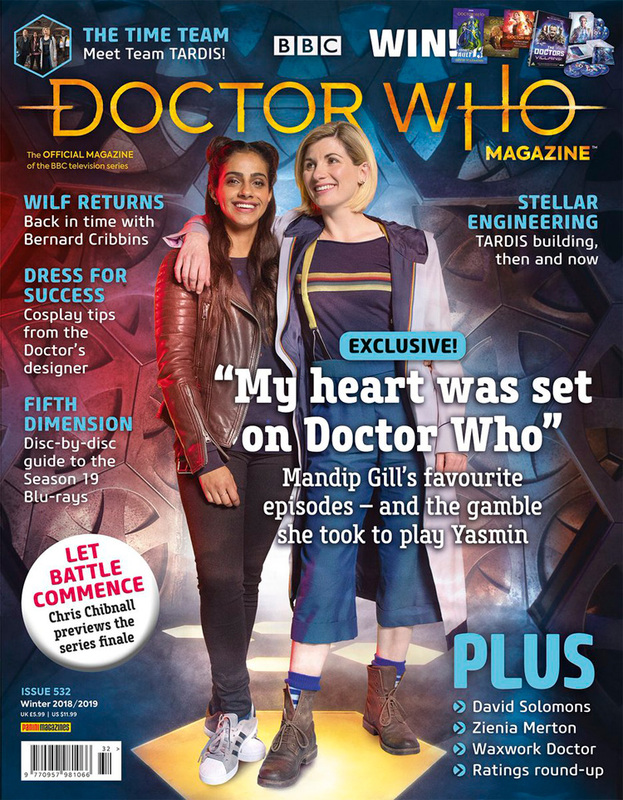 DWM meets Whittaker on the set of the new seriesI don’t ever forget what I’m a part of because Doctor Who’s been around much longer than I have, But every part of this experience is to make it my own. CHRIS CHIBNALL The latest update from Doctor Who’s showrunner. WHO’S CREW Meet the team responsible for bringing the new series to our screens. MATT BERRY He’s best known for his sitcom appearances, but Matt Berry is reinterpreting the Doctor Who theme for his new record. TARDIS EVOLUTION Secrets of the TARDIS control room revealed! COSPLAYA meticulous recreation of the torn coat worn by the Twelfth and Thirteenth Doctors in Twice Upon a Time and The Woman Who Fell to Earth. THE SEVATEEM An interview with Christian Erickson, whose new concept album is inspired by The Caves of Androzani. THE TIME TEAM The Time Team watches four very different episodes in an effort to discover what the First Doctor was really like. THE FACT OF FICTION In-depth analysis of the 2006 Tenth Doctor story School Reunion. PLUS...The Blogs of Doom, reviews, news and a huge prize-winning competition. Juno Dawson is the international bestsellingauthor of ten titles for young adults. She is a columnist at Glamour UK, Attitude Magazine and a key LGBTQ activist with Stonewall. Una McCormack is a New York Times best selling author. She has written two Doctor Who novels featuring the Eleventh Doctor, Amy and Rory: The King's Dragon and The Way Through the Woods. Had one come out then, it would have seen Katy Manning’s companion character Jo Grant – who burst into the Doctor’s life on TV in January that year– featured in annual form for the first time. Instead, her inaugural annual appearance happened the following autumn, in 1972, when World Distributors, which began publishing the official Doctor Who annuals in autumn 1965,resumed their production with an annual for 1973 – the first time the cover borean identifying year. The Manchester-based publisher continued bringing out the annuals until autumn 1985. They say that before you die, your life flashes before your eyes...and the Doctor has lived a lot of lives! The ultimate Doctor Who celebration, a perfect beginner's guide and abrilliant tribute for long-term fans! As the Doctor regenerates into her Thirteenth form, she relives unseen adventures from every single one of her past lives – with a host of brilliant artists including Giorgia Sposito and Claudia Ianniciello! I guess they posted it in preparation for the new season/series. I think people just complain about anything anymore. What could possibly be sexist about that doll? It looks great and it is a doll. I might buy 10 just because. I did have to laugh at the first persons comment on that page. Personally, I think Jodie should complain. That doll's a very poor likeness. I think the doll is great! They've captured the clothing perfectly! As for it being Jodie...I don't think it is meant to be. I think it's actually supposed to be Barbie cosplaying as Jodie as The Doctor so I can forgive it for not looking like lead actor of our favourite show. It's Barbie playing dress up. Sylvester is always the consummate professional and incredibly fun to be around. He always has lovely little ideas that he slips into the role and his delivery is so unique, playful and beguiling. He always surprises you.Putting the Doctor and Mags back together has been very special and these three adventures explore some universally interesting themes, whilst being fun, dark and ultimately a thrilling ride to go on. Where is all their stuff?